​Fergus McTaggart, land steward of Aldmist Fell, has no time for courtship. Any day his employer's long lost sisters will arrive at the Scottish castle to celebrate Christmas, and Fergus is determined to make the holiday memorable--especially for the youngest sister, who has him wrapped around her finger. Unless he takes matters in hand, however, the loud rows between him and the girl's keeper are sure to spoil the festivities. 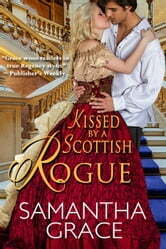 The cheeky Sassenach is not shy about standing toe-to-toe with him, but does she have what it takes to tame him? ​Edith Gallagher has been charged with keeping her employer's lovable youngest sister out of trouble while the family winters at the remote estate, but a stubborn Scottish oaf and his harebrained ideas are making her job more difficult than it should be. Nevertheless, in the interest of making Christmas special for her darling charge, she agrees to a temporary truce with the Scot and soon discovers their passionate battles have been masking a desire she is unprepared to acknowledge. After all, Edith's loyalties will take her back to England in a matter of weeks--even though Mr. McTaggart and a life at Aldmist Fell call to her heart.